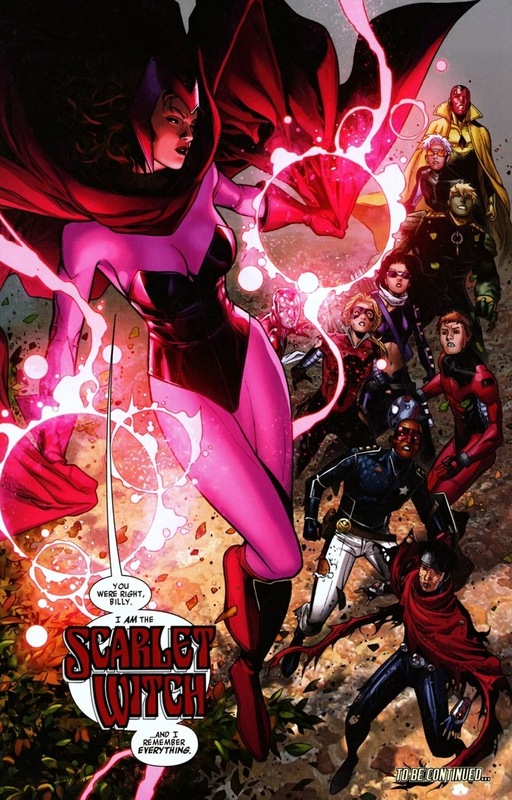 Until 2004, Scarlet Witch had been a card-carrying member of the Avengers. 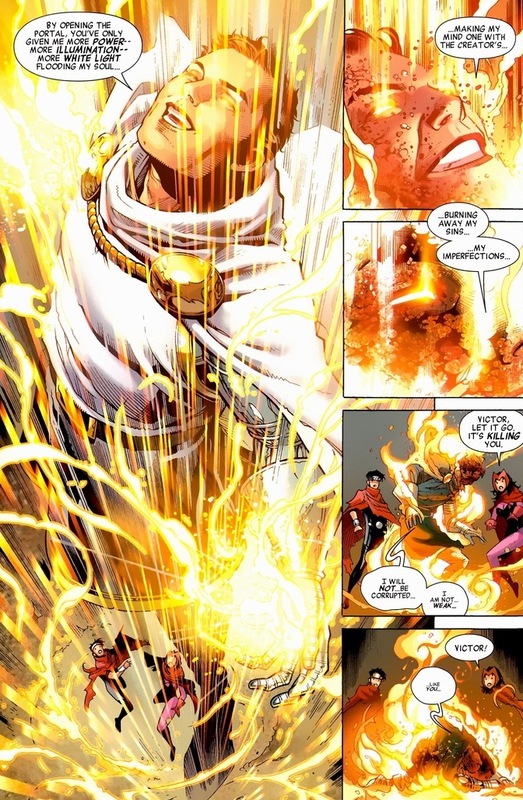 Devastated by the loss of her fictional children that she willed into existence, she took her anger out on the good guys, killing three Avengers and causing 99.9% of all mutants to lose their powers. Permanently. Appropriately, she disappeared for several years. 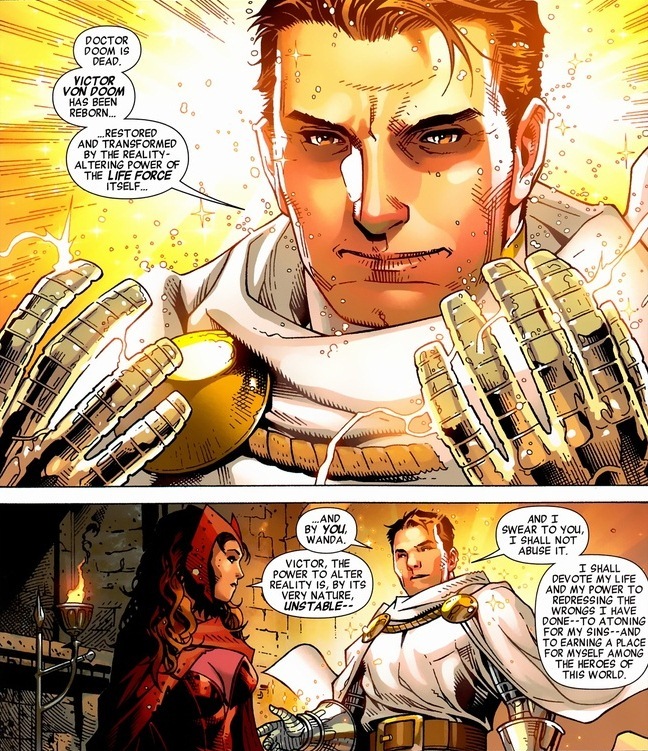 Cue the miniseries Avengers: The Children’s Crusade #1-9, written by Allan Heinberg and drawn by Jim Cheung. 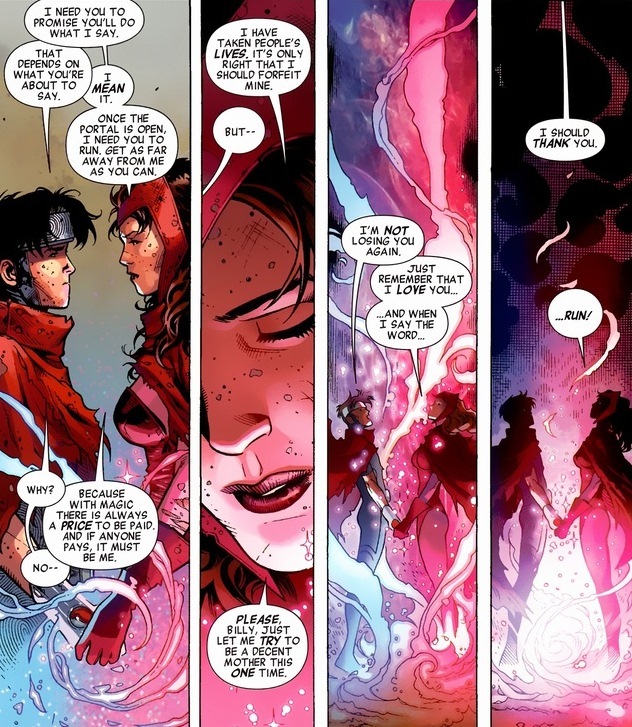 Wiccan, the now perfectly real son willed into existence by the Scarlet Witch, experienced some unstable reality-altering superpowers of his own. 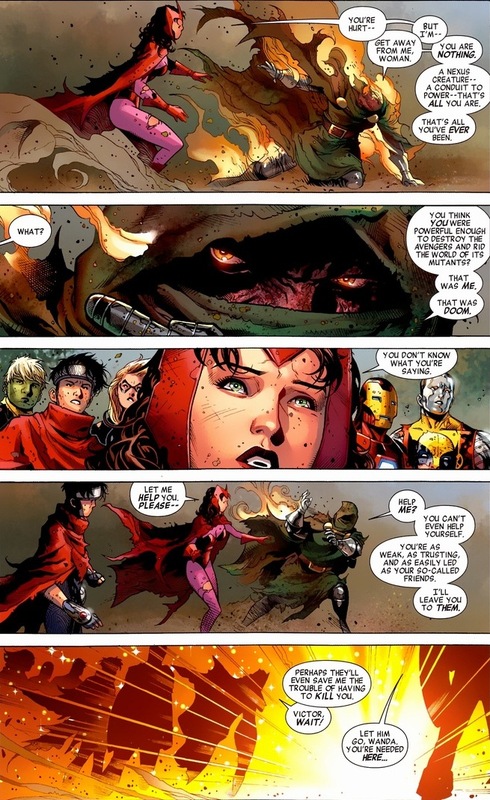 Nervous that he’ll go crazy and wipe out another innocent race like her mother, his Young Avengers team goes looking for Wanda. Well, they find her. Unfortunately, she lives in Dr. Doom’s castle and to say he doesn’t like unannounced visitors is like saying Iron Man’s fond of gadgets. 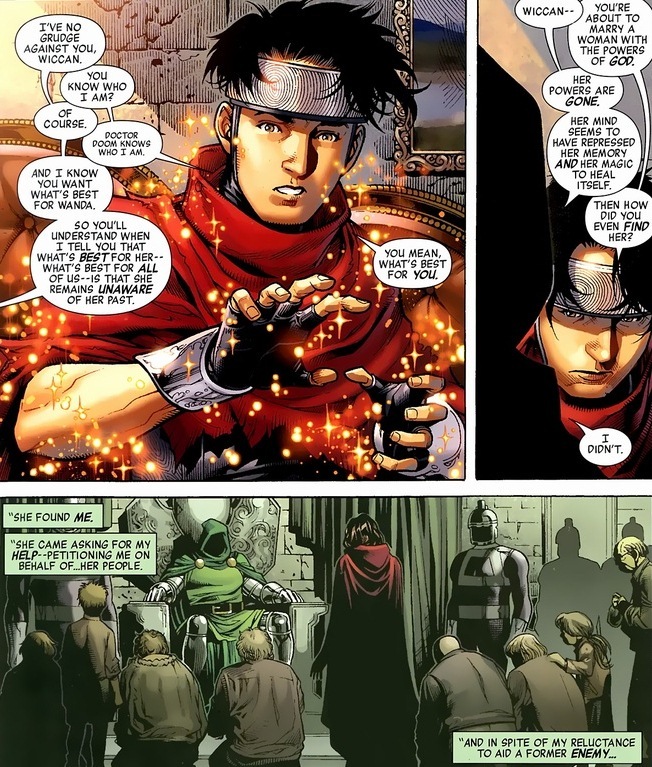 But’s that’s not going to stop Wiccan. After all, he’s a superhero. I always find the most romantic moments in my life also happen next to an unconscious charred teenager. So you want to know some back story? 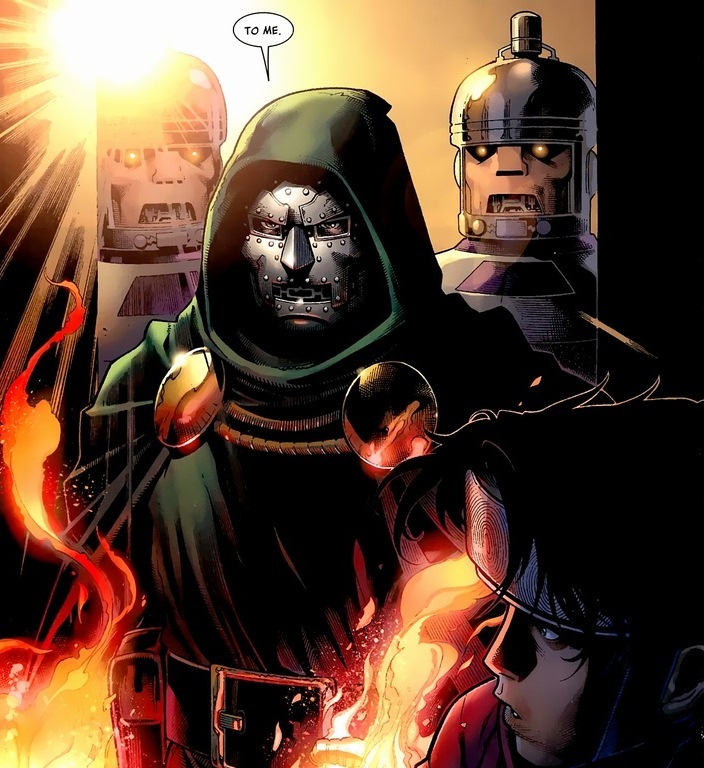 I mean, who could love Dr. Doom (besides Dr. Doom)? Only fair I let the Latverian ruler explain. 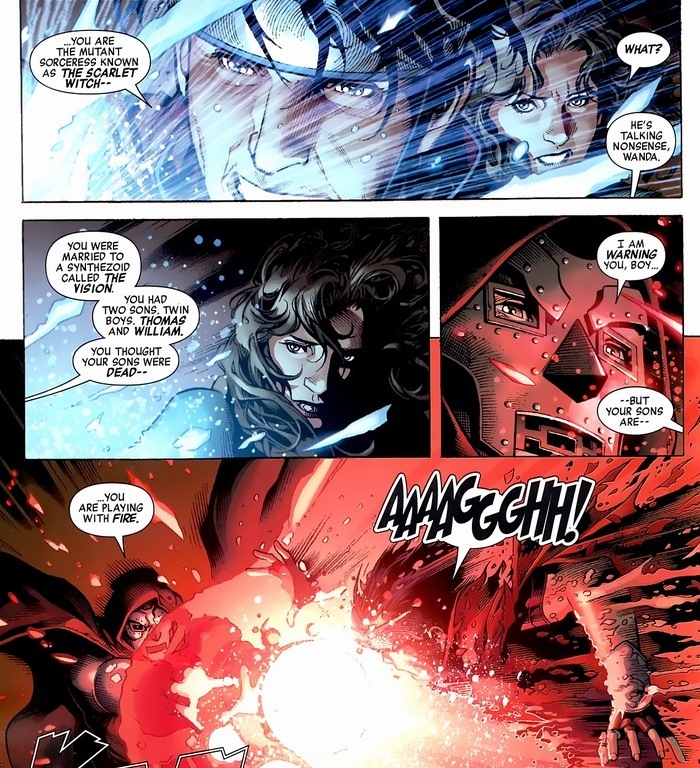 Wiccan doesn’t trust Dr. Doom because there are 50 years of comic books telling him not to. 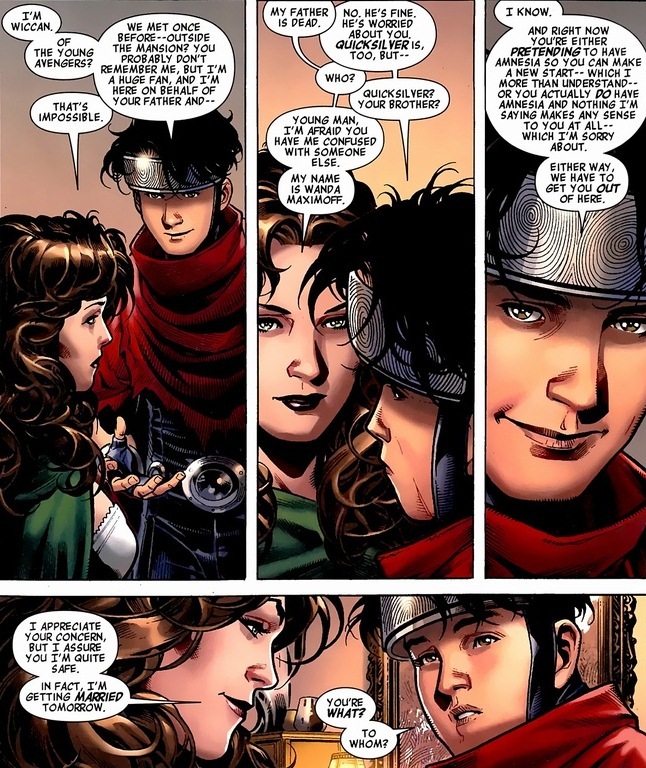 Though without his powers, Wiccan’s kind of a wussy, no matter how strong his resolve. 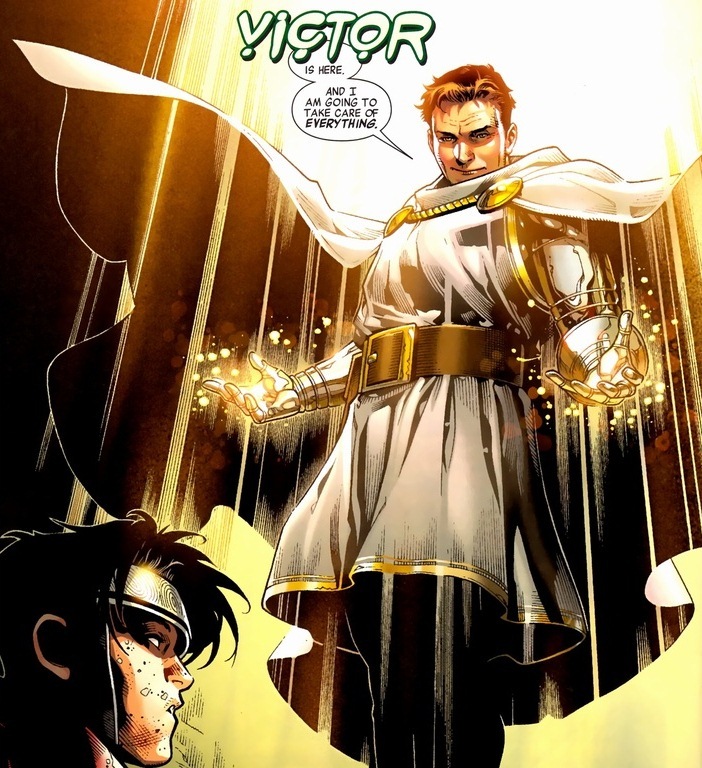 Luckily, you know who else doesn’t trust Dr. Doom? That condition? Nope, not a dirt bike. Escape and all that jazz. 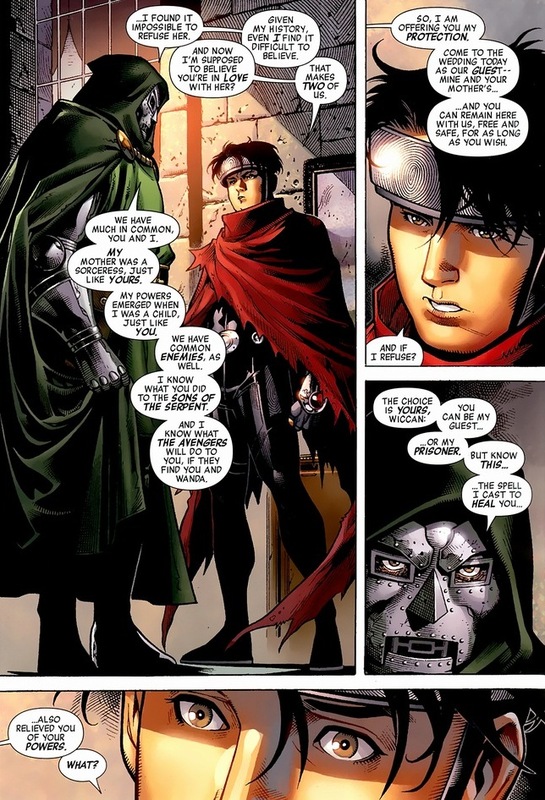 Unfortunately, as much as Doom hates surprise visitors coming into his country, he hates surprise visitors trying to leave his country about the same. Before Dr. Doom could answer a strangely reasonable question, the good guy cavalry arrives. Happens a lot actually. I’m pretty sure that as soon as any superhero gets superpowers, super-timing is thrown in as a packaged deal. Obviously, the Young Avengers bolt. Yay, right? Kinda. Sadly, all that newly regained power also comes with a complete recall of her past crimes and atrocities. And her rap sheet is extensive. But what kind of superhero comic would this be if not for a chance at redemption? And after all, her children are back from non-existence! Unfortunately, the Avengers and X-Men interrupt the tender moment and start punching. 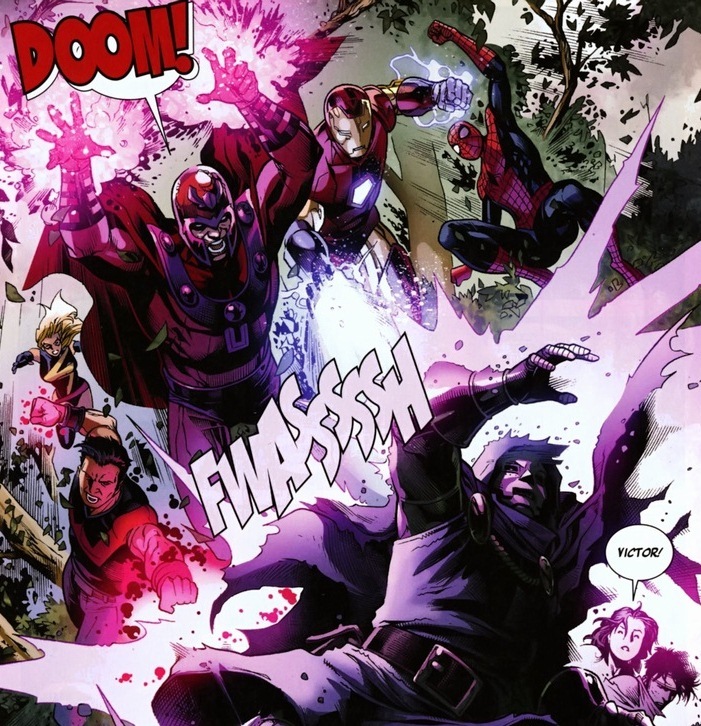 Scarlet Witch single-handedly takes down both teams, but you have to buy the comic for that scene. 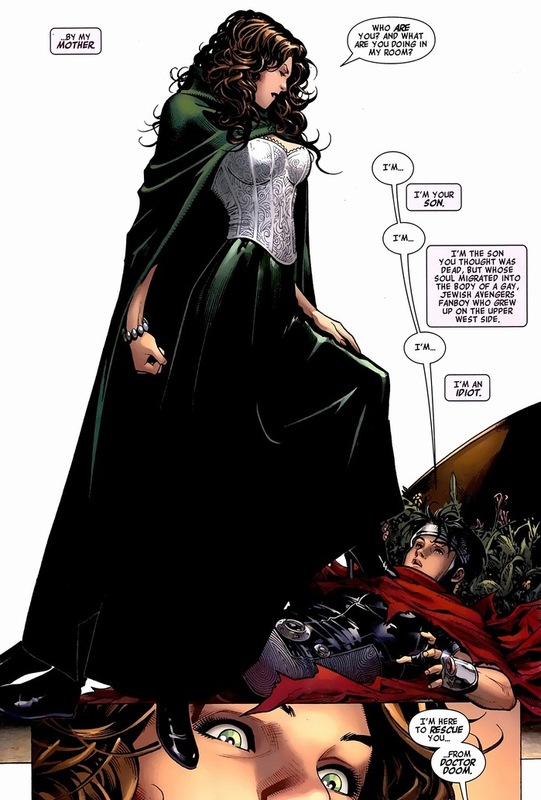 And as the unconscious bodies of superheroes litter the lawn (a common theme in this miniseries), the Scarlet Witch teleports the Young Avengers away. But y’know, not to where they want to go. 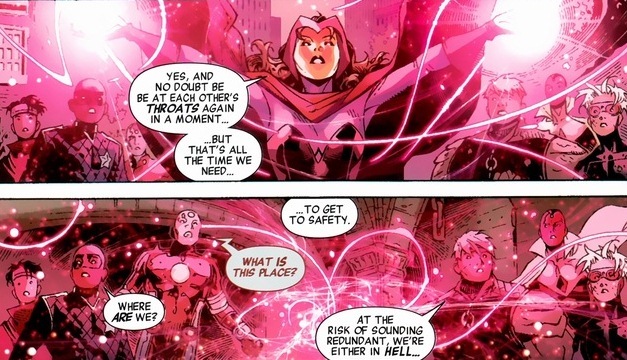 Scarlet Witch and Dr. Doom are still very much in love. And why not? 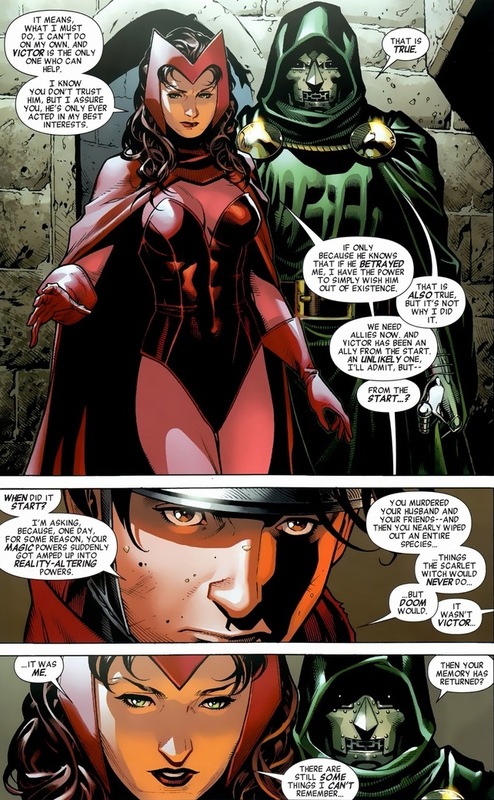 Despite Dr. Doom’s tendency towards being a jerk and his hideously deformed appearance under that metal armor, it’s not impossible to believe that he genuinely cares for and loves the Scarlet Witch. Look, some supervillains are simple and easy to figure out. Red Skull or Mandarin, for instance, just enjoy destruction and evil. 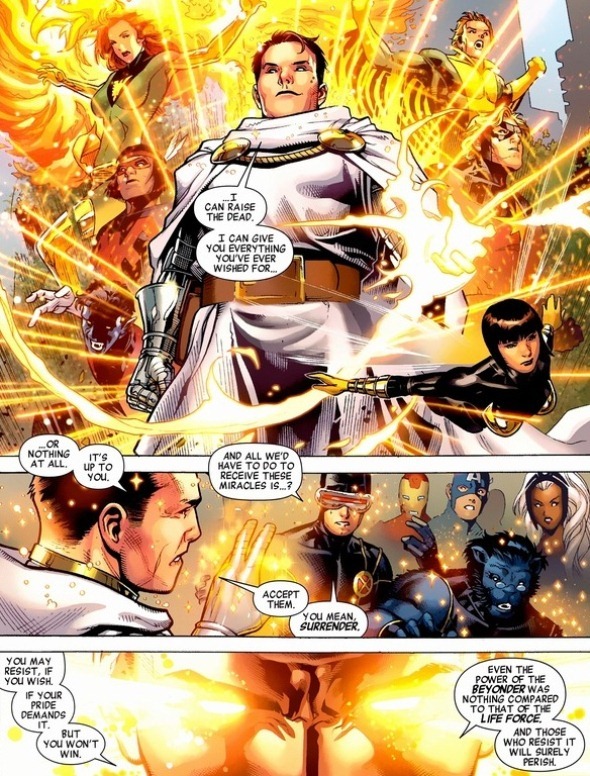 But arguably the two most influential supervillains in the Marvel world, Dr. Doom and Magneto, are majorly complicated with rich, tragic histories ant that may be a testament to their popularity and mass appeal. Just my theory. Oh, now we get the real story of what happened and why she went crazy. To be fair, he hasn’t been untrustworthy so far. Sorta. The magical ritual goes off without a hitch, and by that I mean the results are disastrous and the nexus life force or whatever it’s called goes haywire and violent. Though, out of everyone involved, one person certainly benefits. 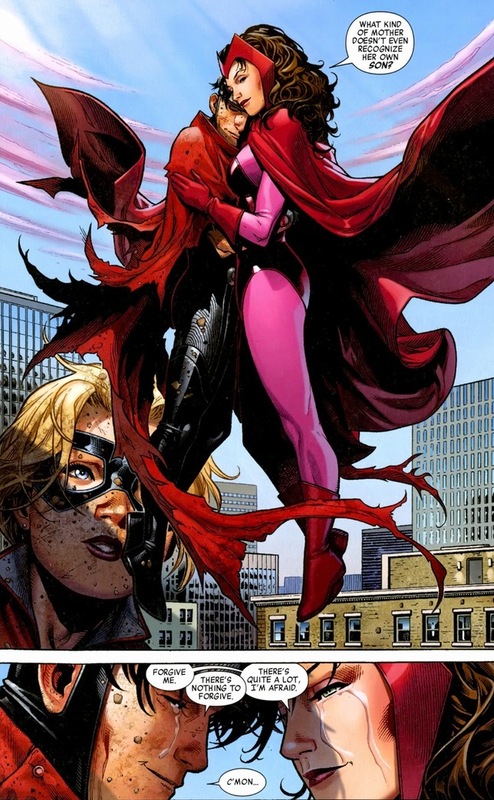 Not Scarlet Witch. She still has her powers. Not Wiccan. He gets all burn-y again. But Doom? You know who isn’t used to compromising? 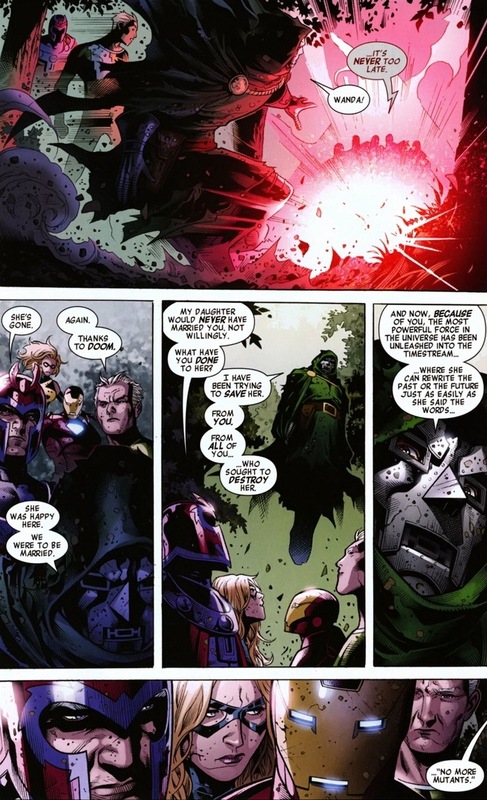 Victor von Doom. Sadly, being a new superhero for the past minute or two won’t erase all those supervillain instincts. 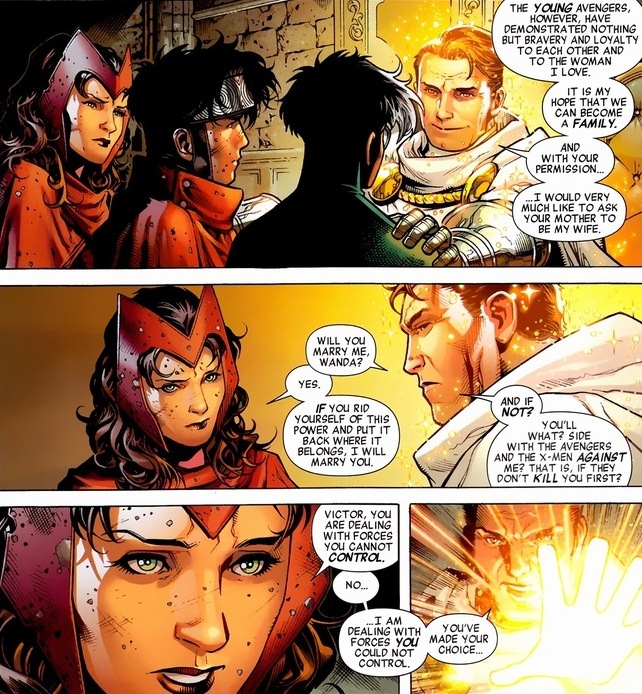 Like an obsession with power, and as much as he loves Wanda (very), he loves power much, much more. 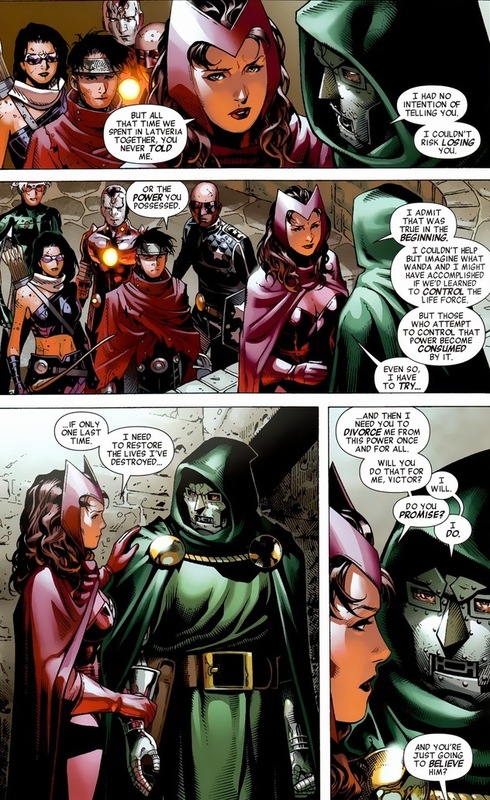 Ah, now that last panel sounds more like the Dr. Doom we know and love. Why won’t these darn superheroes just let him create and rule over a perfect, wonderful world? It’s not like the godlike power will ever corrupt him or make him lose control, right? 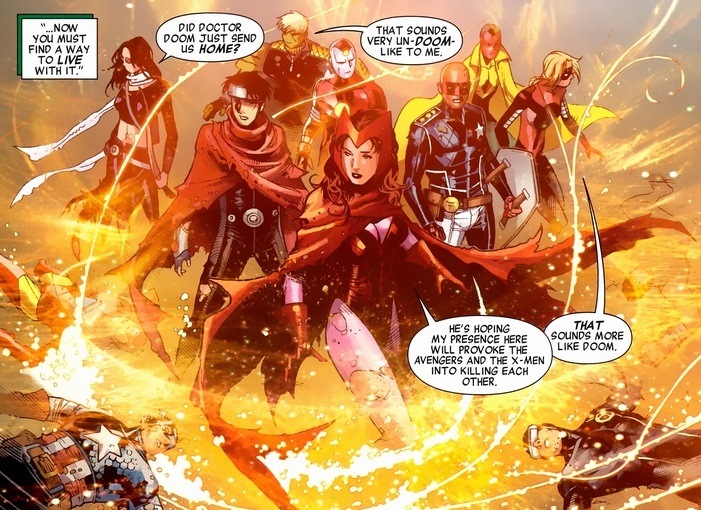 Actually, I also just summed up the plot of the Avengers vs. X-Men event going on right now. So they all fight Doom and it goes badly. 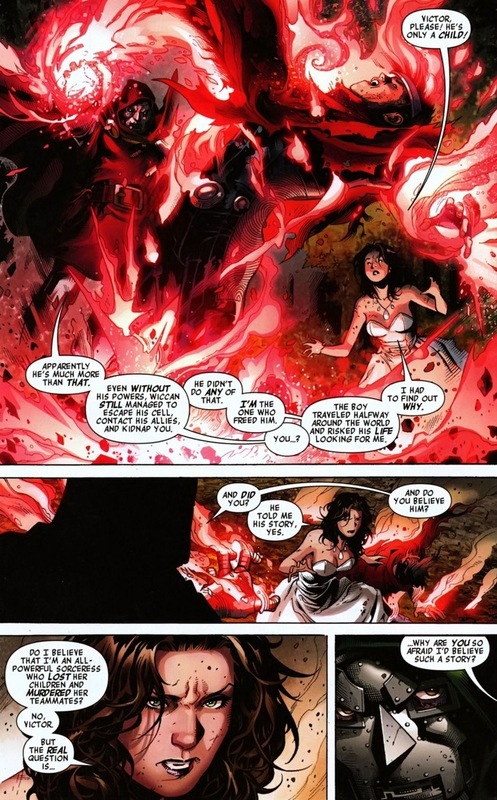 But Scarlet Witch has a last ditch move that may ultimately take down her former fiance. As painful as the illumination fire and return to his disfigured body may be, nothing hurts more than his broken heart (sorry). So who’s the victim here? 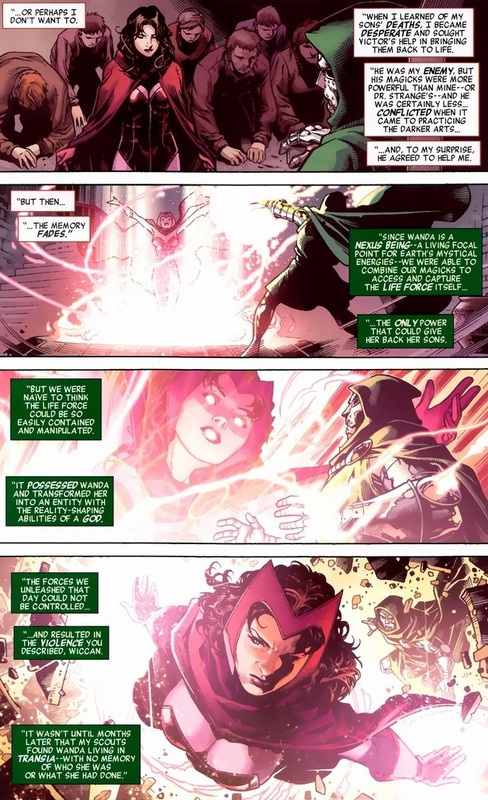 Surely the Scarlet Witch is the villain in this relationship, as she rejected his love over her doubts and lack of trust over his new abilities. But the blame goes to Doom. Once a supervillain, always a supervillain, no matter how many tears he’d be crying if he still had tear ducts. Safe to assume they’re broken up. 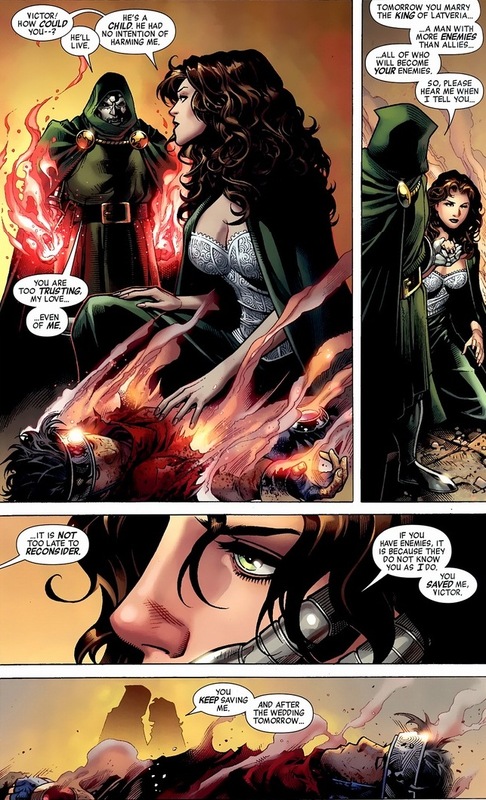 But don’t worry about Scarlet Witch. She’s attractive, self-confident, and nowadays dudes don’t mind dating women with kids. Oh, and did you know she went out with Captain America for a while? He’s a catch. Over 2 years down the road… but this is beautiful Thanks for writing it.